The Los Angeles Science Fantasy Society will soon release its first e-book, an anthology, Ad Astra and Beyond the Forry Award Anthology. 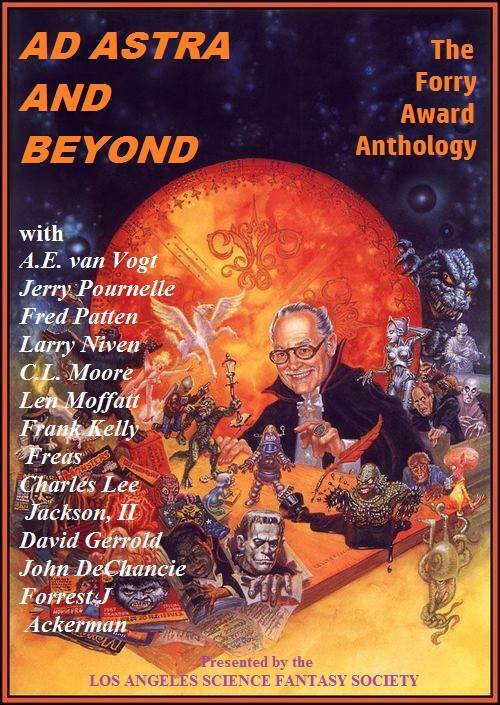 The anthology features some of the top names in science fiction: Frank Kelly Freas, Forrest J Ackerman, John DeChancie, David Gerrold, Len Moffatt, C.L. Moore, Larry Niven, Fred Patten, Jerry Pournelle, and A.E. van Vogt, all of whom are among the honourees of the “Forry Award”, presented each year since 1966 to an individual for an outstanding achievement in the field. Edited by Forry laureate Charles Lee Jackson, II, the volume includes fiction, non-fiction, art, and even a filk song, a cross-section of the talents of those who have been honored with the Forry Award. This entry was posted in Clubs and tagged Charles Lee Jackson II, Forrest J Ackerman, Forry Award, LASFS by Mike Glyer. Bookmark the permalink. well, you got one order…. I found myself wondering who painted the cover. My guess: Kelly Freas. I looked it up, and found my guess was correct.